Share the post "Smart analytics: unlocking the true value of big data"
Data is an organization’s most valuable resource. Data never sleeps. Every second massive amount of data is created from every website, phone, sensor, and whatnot. Whether data are useful or not, more often than not, we store them for future references. If we look at numbers, we generate more than 2.5 quintillion bytes of data every day. This situation poses many big data challenges, but organizations have now learnt that knowing how to get insights from data will lead them to success. We live in a data-driven economy where companies have already started generating business value from data. 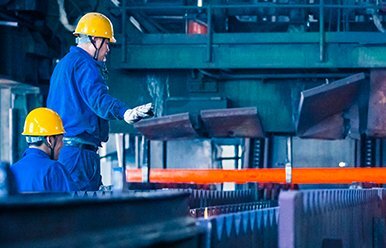 With the advent of the Internet of Things, increased connectivity and improved analytics have enabled companies to unlock significant opportunities lying in data. Big data solutions help enterprises enhance situation awareness, take better decisions, and gain competitive advantage. 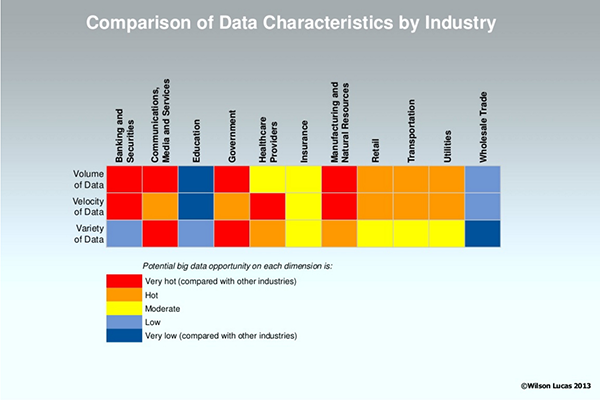 Big data analytics has brought a drastic change in most, if not all, types of modern industries over the past few years. As data continues to permeate our everyday lives, the focus now has been remarkably shifted from the hype surrounding it to actually unlocking real value in its use. 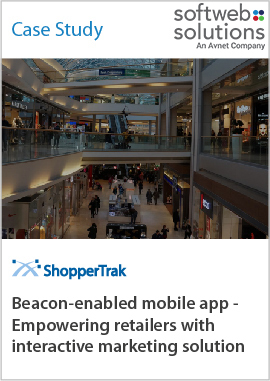 ShopperTrak was looking for an in-store beacon based marketing and advertising solution for casino, resort, and mall. There is a great amount of value to be obtained from the vast amount of data organizations possess. 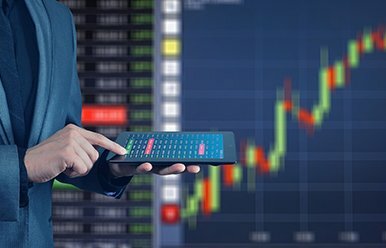 Smart analytics can draw insights and value from data archives to fulfill business requirements while successfully meeting both budget and market challenges. Let’s take a look at big data and its application in different industries. 1. Many organizations fail to identify the right data or have no idea how to best use them. 2. Insufficient storage capacity and analytical capabilities to handle the massive volume of data. 3. 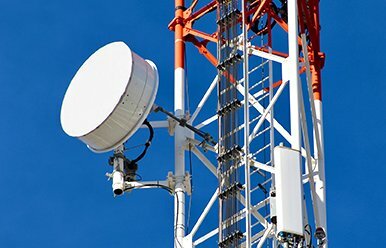 Many enterprises lack the right kind of infrastructure or connectivity that can provide seamless access to data. 4. Since data may come in a variety of formats, organizations often find it difficult and expensive to analyze and dig up insights. 5. Data is generated at the exponential rate of velocity, which makes it difficult to perform real-time analytics that uncovers the intelligence they contain. 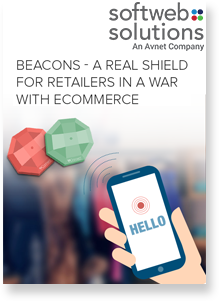 Beacon technology is dramatically creating waves in retail industries. 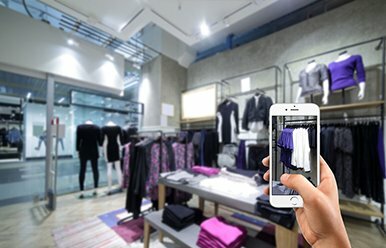 The tiny transmitters for [Read more...] microlocation are going to drive the next phase of innovation in retail. Traditional ways or obsolete technologies to store and manage data may prevent companies from gaining insights. Since traditional methods are time intensive and may result in fragmented data, 70-80% of an analyst’s time is spent in searching for data. It means that only 20% of the time is spent on doing an actual analysis to generate insights. Use of traditional methods will not empower enterprises with predictive capabilities and thus, analysts will have to rely on the intuition rather than letting the data tell a story by bringing out critical and unforeseen insights. Today, organizations should move away from traditional methods to data-driven methods to gain rich insights and transform a decision-making process. 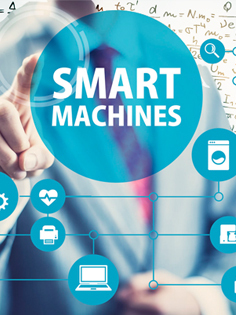 Softweb Solutions helps enterprises leverage the power of big data by providing IoT and smart analytics solutions. We combine the strength of our data science team that consists of data scientists, analysts, and engineers to build a smart analytics platform to extract new insights. Big data management: There is a massive explosion of machine-generated data (such as the log files that servers generate) and human-generated data (e.g., emails, presentations, photos and video files, etc.). Depending upon requirements, a batch processing system or a stream processing system is used to manage big data. Data management and storage: High velocity, volumes, and a variety of data are acquired, stored, and managed to make sure that enterprises have access to high-quality data for big data analytics applications and creating business intelligence. Both structured and unstructured data are stored in one place rather than being stored in silos. It’s secure, scalable, and schemaless. 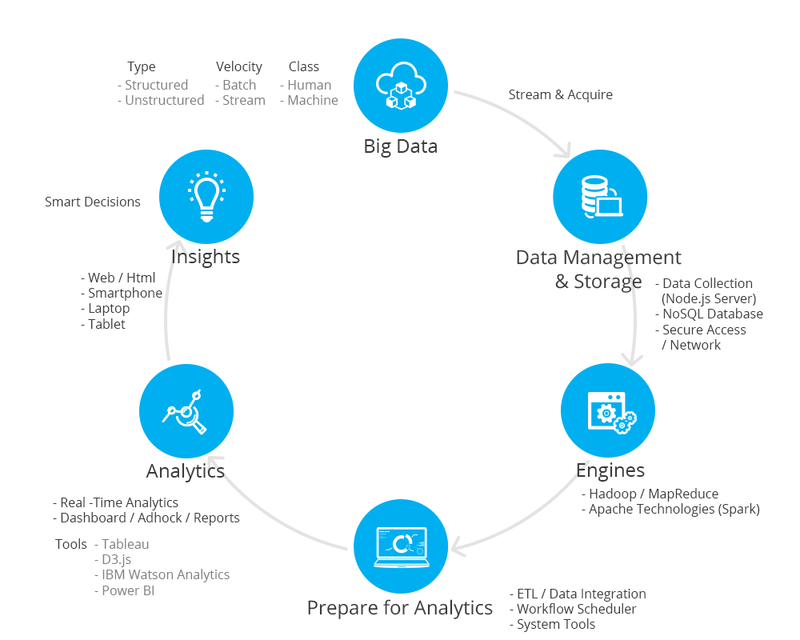 Engines: Big data processing engines (like Apache Spark and Hadoop) are used for large-scale data processing and sophisticated analytics. Preparing data for analytics: Sophisticated visuals help enterprises drive decisions and actions. 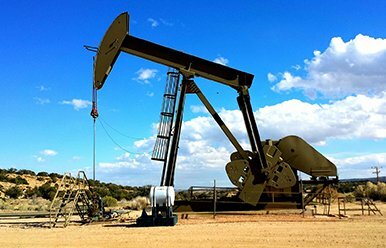 This step involves quality improvement, data integration, and other preparation for analytical activities. Analytics and data visualization: Data is collected and put into a structure for data analysis. 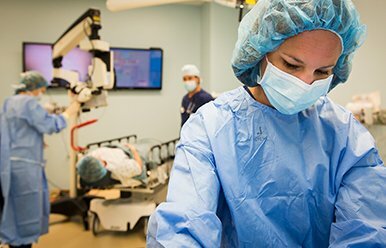 This step consists of services or tools for analysis. The best visual representation is identified that goes well with a dataset and communicate the whole story that was hidden previously. To assess large volumes of incoming information, real-time data streaming and analytics methods are used. Data visualization helps companies uncover hidden patterns and information that remained inside their data by placing it in a visual context. This is where human insights and actions occur. With big data and smart analytics solutions, analysts will spend only 20% of the time at searching data, meaning 80% can be focused on human analysis that drives intelligent business decisions. 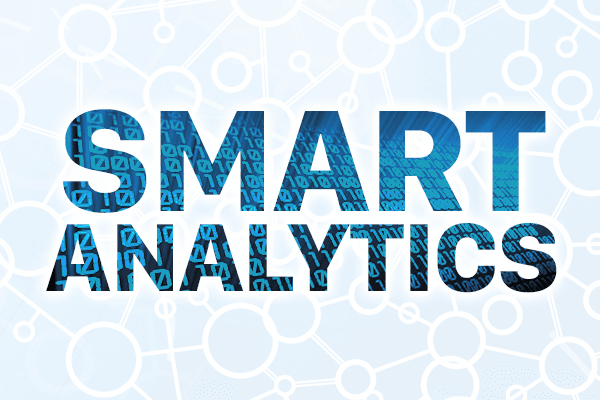 This turns big data into smart insights. With our data science solutions, business decision makers can access data-driven insights in minutes and use them for making critical decisions with a higher level of accuracy.